Ballantyne Corporate Park tenants and employees can save by presenting their BCP card to our repair staff! Ballantyne Jewelers features an on-site repair facility. Our master goldsmiths are the finest in their field and utilize the latest technology in laser machines. They take great pride and care in your repair. All repairs, sizing, complex settings and jewelry designs are done in-house. 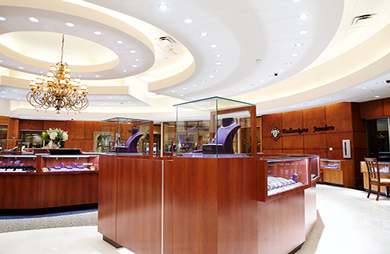 We invite you to visit us to see a first-hand look at how we care for you and your jewelry. Rather than being just cosmetic items, watches and jewelry can have a lot of sentimental value, and you can't replace a gift that showcases the special moments in your life. When a piece of jewelry breaks, people often experience a lot of stress, and they don't know where to turn for answers. If you are going through a similar experience, then you are likely wondering where you can find a high-quality jewelry repair service in your area. When you want to restore your jewelry so that it will look new again, you won't want to trust just anyone. The good news is that those who are searching for a watch repair service know that they can count on Ballantyne Jewelers to get the job done right. When you are ready to go to a watch repair shop, you might be asking yourself why you should choose us, which is understandable. Our team knows how important your watch is, and we will work hard to repair it. In addition to being highly trained and qualified, the experts at our shop are also kind, caring and compassionate. The first step involves looking at your watch to determine the extent of the damage, and we will then tell you what needs to be done to restore it. When you opt to work with us, you will know that your watch is in good hands, allowing you to relax and to have peace of mind. When you need to fix a piece of jewelry, you are invited to visit our shop in Charlotte NC. You will be greeted with a warm smile when you come inside, and we will help you find the best solution for your needs. Unlike other jewelry stores, we won't ship your watch to another location. In most cases, you will be able to walk out with your repaired watch on the same day.